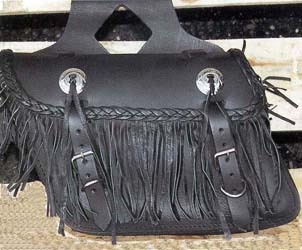 Braided Leather trims the fringe on this saddle bag. Conchos are silvertoned and match the other jackets,etc., in this group of accessories. Cut outs. Slant build is stylish and practical. Medium sized. Sizes: 12- 1/2" x 9" x 4"